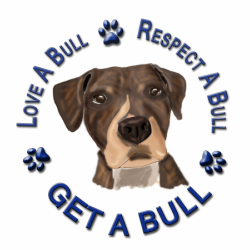 Get A Bull is a collaboration between a group of passion-driven animal lovers looking to make a difference in the lives of pit bull dogs in the New York Area. Our collective backgrounds in the area of animal rescue, animal shelters, dog training and veterinary medicine have given us special insight into the plight of the pit bull breed of dogs. We know these dogs and we know them to be just that, dogs. We have seen the impact that overpopulation, backyard breeding, and neglect has made on these dogs. We see that the shelters are filled mostly with pit bulls and that most good dogs don't make it out alive due to lack of space. We know this is not the fault of the pit bull, but of humans who use and abuse them and continue to breed them. We also know that discrimination towards this breed by landlords, insurance companies, government and in the media, continues to make this an uphill battle. We want to bring to light that these are lovely family dogs that people should consider adopting. But we also know that adoption is only half the battle to helping them. Our goal is to match great dogs with great families but also to facilitate and promote spay/neuter in the communities, promote responsible dog ownership and to provide the resources and education needed to keep dogs with their families.